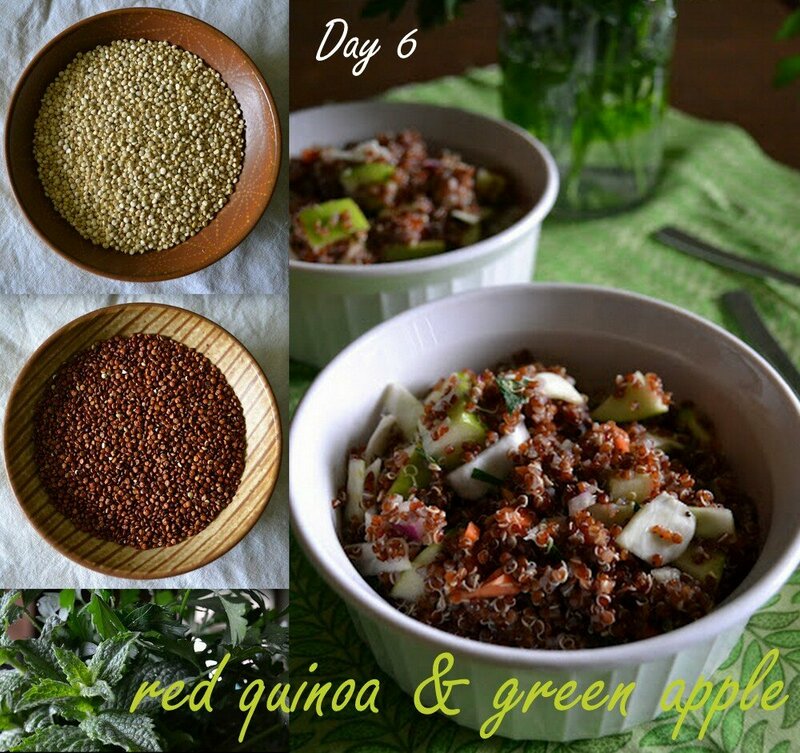 Red Quinoa & Green Apple Salad. Oil-free. Red Quinoa & Green Apple Salad. Oil-free. Big thanks go out to Holly at My Plant-based Family and to Averil at The Cook, The Baker and the Clay Boy Maker for sharing The Versatile Blogger and The Sunshine Awards with me. Woohoo! I really appreciate the recognition from these two wonderful women and am enjoying their posts and getting to know them both. Please take some time to check out their blogs. A few years ago, I had no idea what quinoa was. And when I first saw it, I had my suspicions of the tiny little “seeds” with the funny curly-Qs, but now it’s standard fare in our house. We love the taste, appreciate its versatility and rely on its wonderful health benefits. But a recent article in the New York Times, Quinoa’s Global Success Creates Quandary At Home, put a different perspective on this chenopod (or goosefoots – love that name). Because of high demand for quinoa in Europe and America, less Bolivians are able to afford to eat the crop that they grow – and they’re suffering nutritionally (quinoa is considered exceptional in the plant kingdom for its balance of nutrients) as a result. Makes one pause and think about where one’s food comes from – and it makes me even more appreciative of this special plant. This recipe comes from a book called Gluten-free, Sugar-free Cooking, by Susan O’Brien. This is not a vegan cookbook, but there are some really inventive recipes in it and one of these days I’m going to dive into her desserts. I didn’t change a thing with this salad, except that I used cabbage instead of red pepper, because I didn’t have one. It’s one of those salads that you could add almost anything to – steamed asparagus, navy beans, celery, tofu, crumbled tempeh bacon, nuts – nearly endless possibilities. But what really drew me to this salad is that the dressing contains no oil – just the way I like to make it. Combine the quinoa and the water and bring to a boil. Reduce the heat and cook, covered, for 10-15 minutes, or until the water has been absorbed. Set aside to cool. In a bowl, combine the cabbage, red onion, carrot, parsley, apple cider vinegar, vegetable broth, salt, pepper and garlic. Add the cooled quinoa and the chopped apple, stirring gently. Serve as is, or over a bed of fresh greens. On a side note…Yesterday I made maybe the coolest thing ever – and it was really simple. I may never go back to Earth Balance or store-bought shortening again. Thanks to Keepin’ It Kind, I found out how to make my own butter. Check out her post, then go to the original recipe here. There is all kinds of interesting science involved, but my eyes started to glaze over (much like they did in high school chemistry class) and I skipped down to the recipes. It’s really fun, easy and best of all, you know what’s going into it (though, yes, it’s still fat). And there are all kinds of variations, many of which I’m planning on trying soon. It IS very sad – and to be a small part of the problem – it really does put a pall on eating quinoa. I don’t know if there has been an attempt to grow it elsewhere, but I suppose if there is money to be made by trying – it will happen. Of course, then you get into the issues of industrial farming, which are unsavory to say the least…Sigh. Well, first of all- that salad has my name written all over it. Apple and Quinoa is one of my favorite salad combos.. throw in some avocado… But I digress. The salad looks lovely! And I am so, so, so glad you like the butter recipe! You are so sweet, Annie! Vegan butter recipe? I’m sold! Beautiful salad once again! You are inspiring me to get more creative with my own! It’s been fun – and the thing is – almost anything goes in a salad! The quinoa situation is so tough. I am always mindful when I eat quinoa to appreciate it as much as possible. Gorgeous salad! But I can’t get to the vegan butter link no matter what I try. Fortunately, I’m nothing, if not persistent, so I will make it work. It took forever for the site to load when I checked. I can shoot you the recipe (it’s ridiculously simple) if you’re interested. If I keep having trouble, that would be great. I tried to get to it from your link, tried to Google it myself It keeps “failing to open.” I might just need to shut down (figuratively, though literally would be really great right this second). Quinoa and salad is the big thing right now for all of the healthy ladies in my workplace. I usually go for midday protein but this looks like it would make for a pretty radical dinner option. Yeah, I know – quinoa is trendy right now – but I love the little buggers, despite the popularity. Definitely lots of possibilities – just wouldn’t recommend cramming a hot dog into it (or cheese) ;-)! Despite being pretty big into food quinoa slipped under my radar for a long time until it became “trendy.” But it’s great, so why had I never heard of it before 2005? Ohh quinoa and apples..sounds amazing! I have mixed fruit with quinoa before, but never green apple. I will have to try this. The vegan butter looks amazing! What, day 6 already?! I’m going to miss this series..once again, beautiful salad! I love new experiments, too – especially when they work! Give it a try! Quinoa & Apples, never thought they would go great together =) Btw what’s the difference between red & white quinoa? THanks! I think just the color – though maybe the red has more nutrients, in the way that red cabbage is slightly more nutritious than green?? This salad looks amazing, tasty & apart too! 🙂 Waw: home-made vegan butter! So cool! We can’t find xantan gum over here what else could I use? Hey! How are you feeling? Wow, okay, so I did a quick search for xanthun gum substitutes and there are a few: http://www.ehow.com/list_6899807_substitutes-xanthan-gum.html This site should help! You are most welcome! Sophie, I’d love to have you be a part of the Virtual Vegan Potluck!